I ran across a post from Crafty Chops about random acts of kindness: "The idea is that random acts of kindness are given without expecting anything in return. Just passing on the kindness, hoping that your recipients will do the same and forming a never-ending chain of kindness." She, following the idea from two other blogs, is making 3 gifts to send out into the world. Since I was one of the first three people to comment on her post, she'll be sending me a prize! I, in return, will be paying it forward to the first three people to comment on this post who promise to pay it forward to three more people. I would be nice if you had a blog, but it's not really necessary, so long as you're serious about paying it forward. So who wants to get a cute crafty prize from me? Who is going to pay it forward? In other crafty news, my mini quilt partner received her quilt today so I can finally post pics! In this swap (Charming Mini Swap on Flickr), we all sent our partner around 30 charm squares and a fat quarter. That was all the input we got into our mini. My partner and I have very different fabric tastes, but we were up for the challenge. I made her a tree since her fabrics reminded me of fall. I can't wait to see what she created for me! me! me! me! Id like to play Kelly. 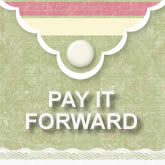 Im just getting finished with my current pay it forward, but would love another round with you Kelly! Me Me!! I don't have a blog but I'll pay it forward! I can send three gifts!